Brainchild of environmentally-conscious Australian Hairdresser, Karen Ellis. 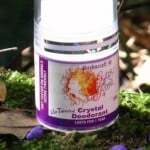 Initially she developed and produced “Gypsy Rose Australia” range of un-tainted hair and body products in the pristine mountain ranges north of Brisbane. Karen personally experienced a bout of serious illnesses and painful skin conditions caused from the over exposure to hair dyes, perming solutions, and synthetic shampoos/ conditioners. 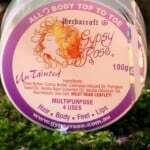 As a result, she developed the Gypsy Rose range for her own personnal use. While she soon realised that her reaction to the harsh hairdressing chemicals was not uncommon. 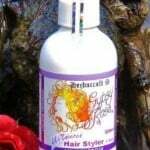 Hence a large and growing market was crying out for pure hair care products that were effective but gentle on the skin, hair and scalp. And so, finally Gypsy Rose was born. 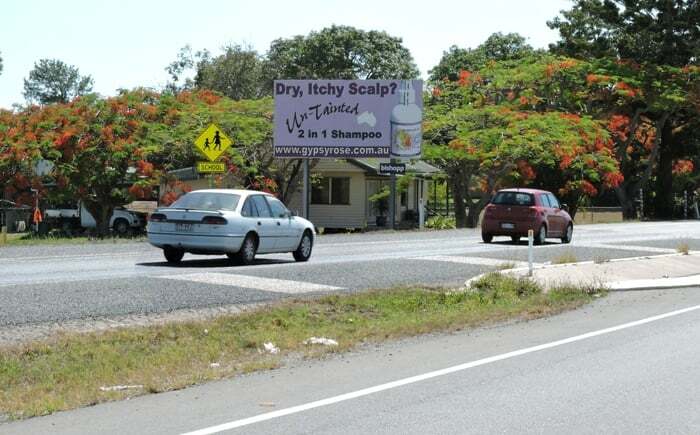 1993 – A Mobile Hairdressing business is started by Karen across 2 QLD shires (Caboolture & Caloundra). Also specialising in natural hair services and supplying pure un-tainted products on a small scale, with paper labels and 100% recycable bottles. 1993-96 – Demand for the Gypsy Rose range grows as the mobile hairdressing business takes off. Consequently over 200 clients start telling their friends about the unique product range. A pioneer of their times. 1996 – The Scissormagik Salon in Wamuran was opened and was soon booked out 4 months in advance, therefore training apprentices begins in her salon. 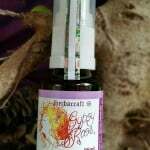 While the word spread, she was approached to take Gypsy Rose first orders from the well known Bullivant chain ‘Natural Alternative Health’ stores QLD. 1997-2000 – As sole distributors nationwide, Scissorcraft has grown the Gypsy rose distribution to over 60 outlets purely by word of mouth. 2002-2003 – The Queensland Supermarket of the Year Awards recognises the Gypsy Rose 2-in-1 Shampoo as a finalist in the non-food category. Also winning a special one off encouragement award and a supermarket opportunity. 2004 – Finally the “Isle of Eire Pty Ltd” Australian organization (‘Eire’ is gaelic for Ireland) was conceived fusing “Scissorcraft” (manufactures) and ‘Scissormagik’ (new salon name). 2006 – Sole director Karen sold the salon ‘Scissormagik” to a former staff member ( Jodie P: 5496 6777) and keeps on running “Scissorcraft” the first formulators of the Gypsy Rose range. 2007 – Current – Professionally Karens time is now solely devoted to product development and promotion. 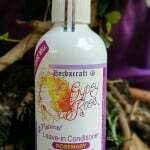 Stay tuned for future product releases such as “Un-Tainted Gypsy Rose” Hair Colours and working on Pet products! 2009 – Gypsy Rose goes international with export agreements to New Zealand, also recurrent postal orders all over the globe. 2010 – Work gets underway to convert the already council approved factory to fully solar-powered-off the grid. Keeping the ingredients energised naturally! 2015 – Especially revelant Gypsy Rose cracks the Chinese market with Australian business Ganbei Global. Currently distributing orders throughout the China region. 2019 – NEW! 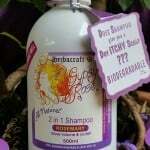 Fight the war on Waste, 1 Litre 2 in 1 shampoos, Kombucha Shampoo Bar for Body & PET Range! Karen tours in-store for new and current outlets during promotional days. Furthermore details can be seen in show times tab. *Reduce – Concentrated long lasting *Reuse – Buy bulk , decant into re-usable 200ml *Recycle – 100% recycable bottles/packaging. Taking a holistic and low waste approach to business, is an important part of the culture of Gypsy Rose Australia. Especially revelant, the solar powered factory is also healthy for the environment. The products are not only free of all synthetic chemical emulsifiers and preservatives, but also all parabens including propyls, methyls, butyls (also propyl alcohol), all sulfates and coco betaine. NEW! 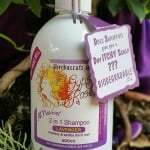 Fight the war on Waste, 1 Litre 2 in 1 shampoos, Kombucha Shampoo Bar for Body & PET Range! A passionate supporter of the old growth forests, hence Karen is driving herself and her company to aim to be a key advocate for the preservation of these key environmental areas. What comes around goes around is her key motto. 100% proven bio-degradable (A/S4351.5) – the products break down into the earth, leaving NO residue. Handmade from cold pressed oils and 100% essential oils, fruits, vinegars, teas and filtered rainwater – we focus on putting the value inside the bottle, not in flash packaging. Completely handmade in Australia from predominately Australian and (only where necessary) imported ingredients. Still the cleanest list around. Multi-purpose products with naturally derived ingredients, tried and tested over 25 years. 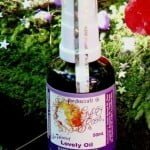 All Gypsy Rose products are GMO-free. All are gluten-free products except Leave in Conditioners. In addition are super concentrated with registered trademarks and detailed product instructions. Product leaflet must be read containing detailed instructions, as our naturally-derived products need to be used correctly to achieve the best results. NOTE: If you experience any discomfort, please discontinue use and contact us immediately. Our product range is not to be taken by mouth. Scissorcraft copyright of all Logos.